The Routes – Each week has a pair of routes designed to get you ready for a Spring half marathon or marathon. 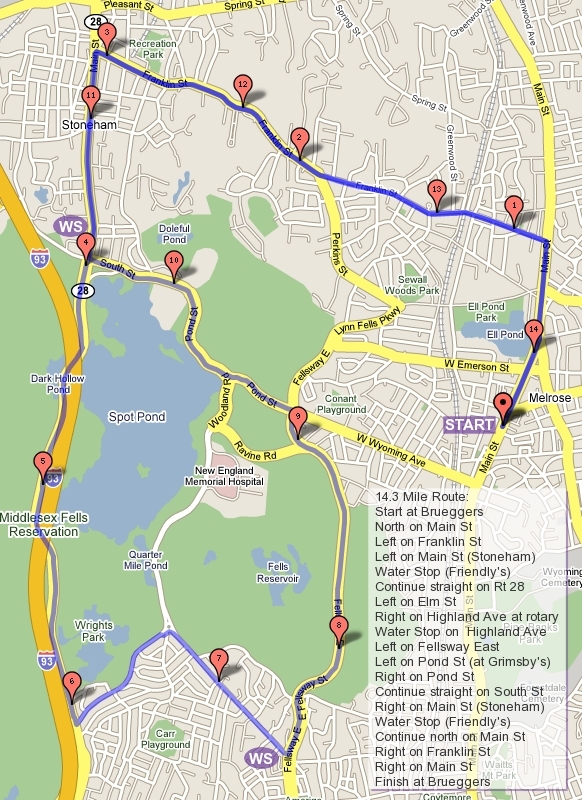 The distances are geared towards Boston but runners can adapt the plan for the race of their choosing. Look at the plan in the sidebar to the right, click on the distance to see the route map. You can adapt as you need, making use of water stops. Here’s a tip for people new to the routes, print a map, stick it in a plastic lunch back and stick it in your pocket. If you wander off the route I guarantee you won’t find a water stop and I won’t be able to find you. The Water Stops – For runs over 8 miles, every 3-4 miles is a water stop. A water stop is usually manned, but may just be a car in a parking lot with water in the trunk. Each water stop is guaranteed to have water, gatorade, and candy to get you through the run. If you need anything else please bring it yourself. We’ll have lunch bags at the start to drop your personal supplies in so you don’t need to carry it (although it is worthwhile to learn to carry your own snacks for race day). The Cost – The Sunday Long Run is funded by your contributions. Waterstop supplies are purchased with the money collected from the participants. These runs are not financially subsidized by the Melrose Running Club or by the Carson family. The minimum contribution is $1 for a short run, $2 for a long run. You can pay per run, or pay for the whole 15 weeks at the start, your choice. We operate on the honor system, pay me prior to the run, or if you jump along the way pay the water stop attendant. As funds accumulate so will water stop supplies. The Training – This program lays out 15 weeks of training meant for the beginner or intermediate marathoner. In addition to these long runs, each runner should develop a weekly running plan to achieve their goal. Typically this includes at least three other runs during the week, a quick mid-distance run, another longer run about 1/2 to 2/3 of the distance of that week’s long run, and a junk miles runs to get your weekly mileage goals. Almost every runner that has completed our training plan with us has finished their half or their marathon, many meeting or exceeding their goal pace. More experienced marathoners will tweak the plan for their needs, and more experienced half marathoners should look to increase their max long run, perhaps from 12 miles to 15 miles. Feel free to adapt the training as you see fit but be sure to let attendants know when you are running something different, we’ll try to accommodate the best we can. If you have any questions take a look at the “About” link at the top of the sidebar to the right. These week we’ll be running Week 0 (because the number of weeks from New Years to Patriots isn’t always the same). Due to the fact that New Years Day is on Sunday, and we try to avoid running with hangovers, the first run will be held on Monday, January 2nd. The first ever MLR will be run from Brueggers at 8AM on Monday morning. The route will be from Main Street up to Ell Pond, bear right onto Green Street and turn right onto the LynnFells Parkway. Turn left at the first set of lights onto Main Street in Saugus. If you’re running short turn left at the first set of lights onto Howard Street, right at Green Street, and back onto Main to finish at Brueggers. If you’re running long continue on Main Street in Saugus and it will become Farm Street in Wakefield. Look for a water stop at Wakefield High School on your right. After the water stop continue on Farm, turn left at the T intersection onto Water Street. Run into Wakefield Center turning left onto Main Street and following that back into Melrose to Brueggers. The Post-Run – Brueggers has kindly allowed us to meet there for our SLRs for 11 years now. I ask you to respect their place of business showing respect to their employees and their customers. Post-run please patronize their business and refrain from bringing outside food and drink into their place of business. The Roll-Call – Please post here with your intention to run and the route you’re planning to run. Typically an IFTH (in for the half) of IFTF (in for the full) will suffice. The responses are used to estimate the amount of supplies to bring for that run.